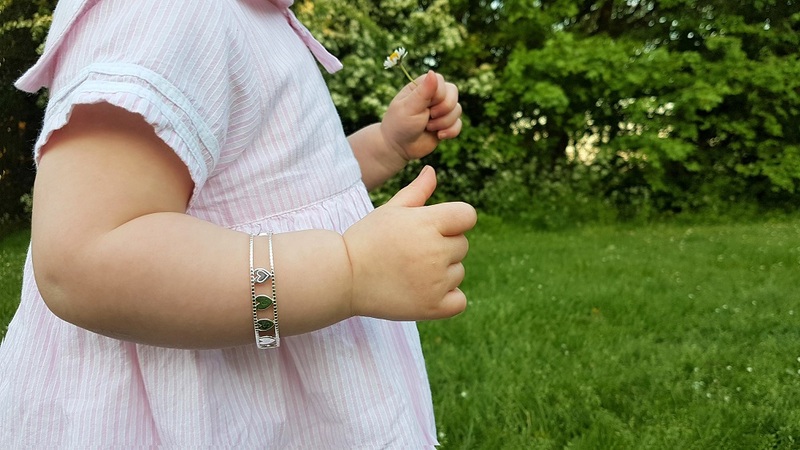 Autumn loves borrowing my husband‘s bracelet and trying it on. She absolutely delights in putting it on and looking at it. 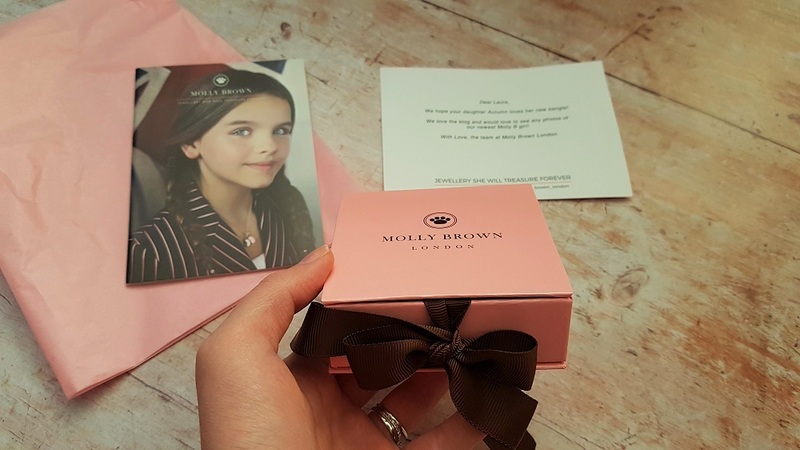 As such, when Molly Brown approached me to review a piece of their beautiful children’s jewellery, I knew a bracelet would be the perfect choice. Just from browsing through the website, you get a good feel of the quality that they deliver. 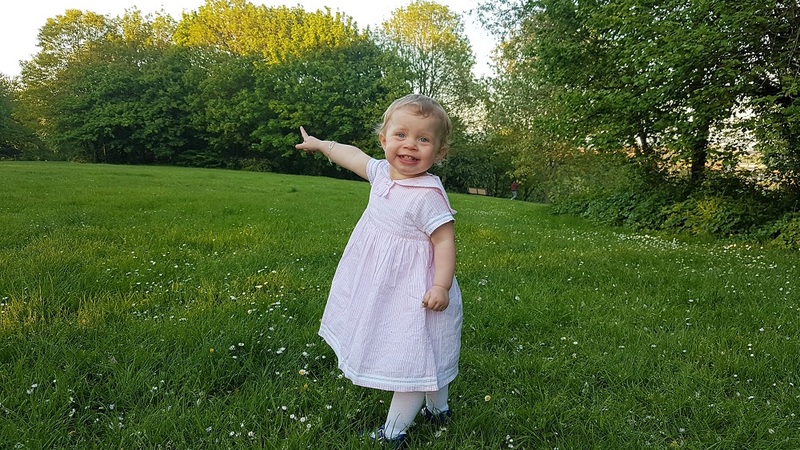 There are gorgeous choices for everyday wear or special events such as christenings or holy communions. 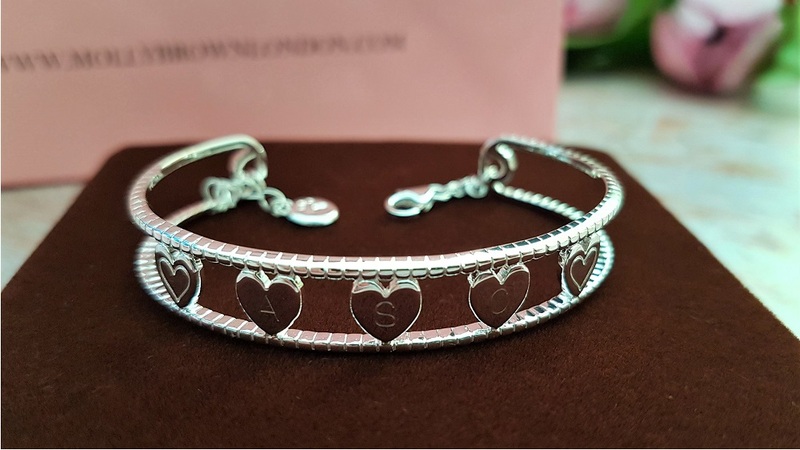 I opted for the Her Love Bangle, which allows for the middle three hearts to be personalised with the child’s initials and I couldn’t wait for it to arrive! When the bracelet arrived, it was so beautifully presented. 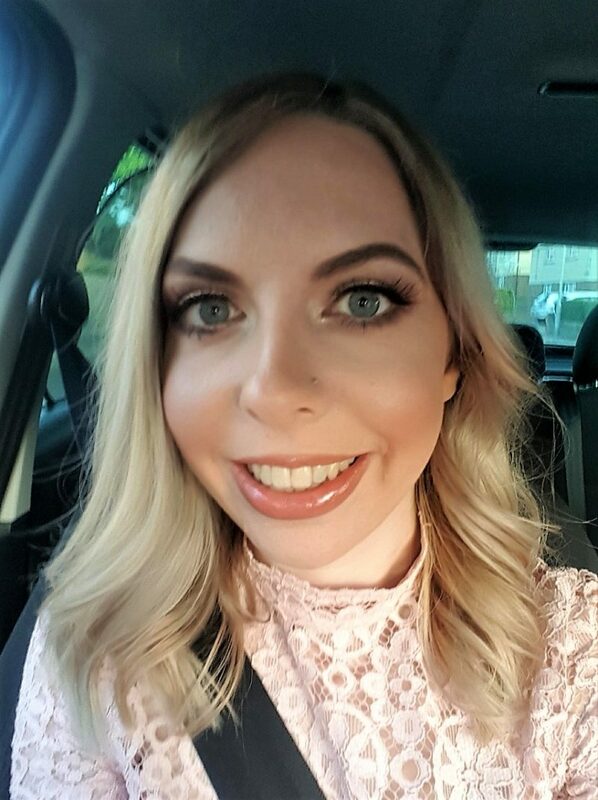 It was in a glossy gift bag with a perfectly tied bow. If you bought this as a gift for a little girl, you wouldn’t need to worry about wrapping it. It looks wonderful just as it is. I hesitated to open it, in fact, as it looked so lovely. However, I was excited to see the bangle so I went ahead. 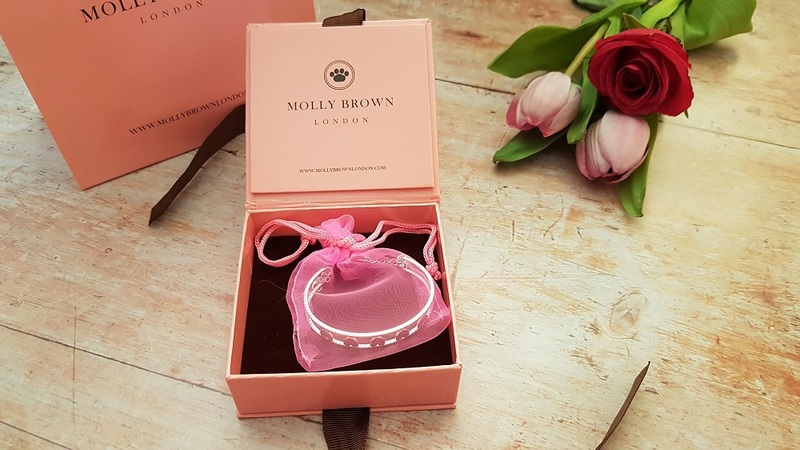 The bangle itself was inside a pretty bag in a presentation box with the Molly Brown branding on it. 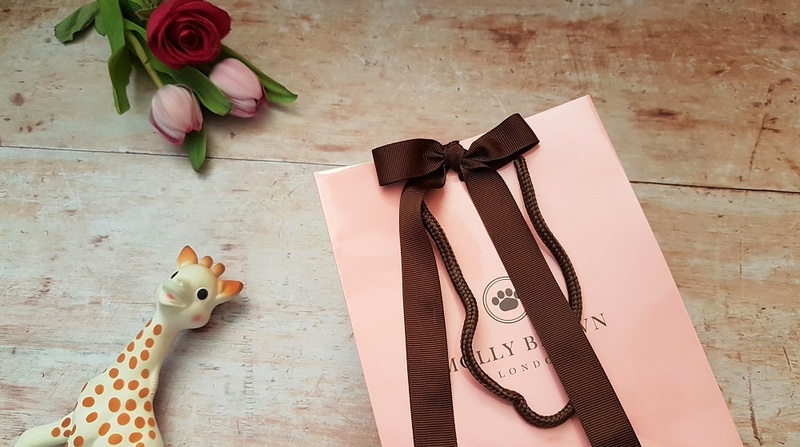 In my experience, Molly Brown certainly do deliver; it’s not just the website that looks good quality. From the designs and quality of the jewellery to their presentation, everything is first-class. The post had arrived while Autumn was napping, which allowed me to take my time in admiring everything. The Her Love bangle is beautiful, I like how it’s detailed but also quite simple. 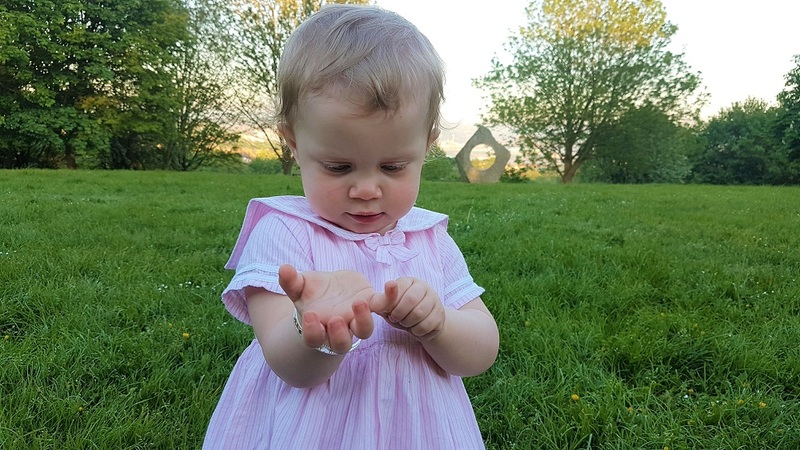 It would make a perfect gift for a new baby or a first birthday. As soon as Autumn awoke from her nap, I put it on her and she adored it too. 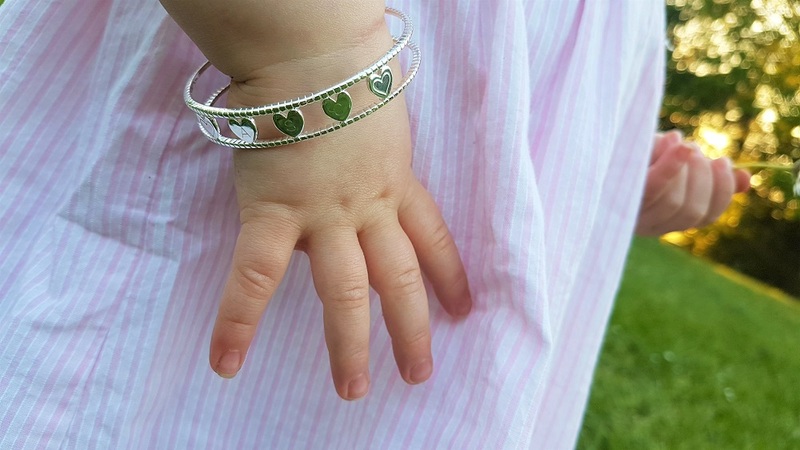 It was a little fiddly to put on her, but then she is small and of course the bracelet is too. It certainly didn’t help that she was full of energy and trying to get away from me to find little things to put in the presentation box! There is a baby section, but this was from the child’s section. It’s adjustable with a lobster clasp and will therefore fit her for years to come. The bangle is beautiful and would look wonderful with fancy party outfits, as well as everyday clothing. It all depends on how you wish for your child to wear it! I adore the simplicity and beauty of the design, as well as how well made it feels. One of my favourite things, of course, is that it has Autumn’s initials on it. This makes it extra special and I just know we’ll treasure it for years and years to come. Disclosure: I was sent the aforementioned bangle for the purpose of this review. As always, all views and opinions are honest and my own.